Whiteside Mountain dominates the landscape between Highlands and Cashiers, rising more than 2.000 feet from the valley floor, with sheer cliffs more than 700 feet high. It is the most impressive of the high-elevation granitic domes in the southern Blue Ridge escarpment region, both visually and floristically. At least 14 natural-community types occur on the mountain, including the old-growth, high-elevation, northern red oak forest that covers much of the summit. The loop trail is a National Recreation Trail and part of the Forest Services fee program. You must pay $2 per vehicle to hike the trail, but most of the money collected remains within the district to help fund visitor improvements. A word of warning is in order before you decide to make this hike. 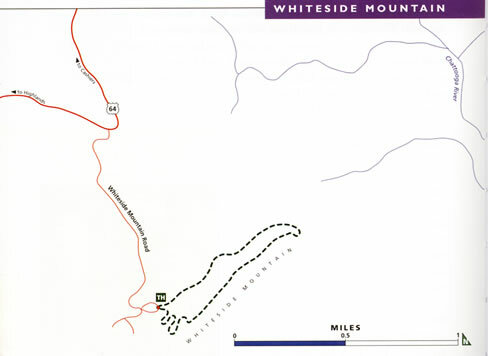 If you are careless, Whiteside Mountain will bite you. The trail leads next to sheer drop-offs and slippery rocks. Watch yourself, and don't let the kids run ahead. After paying the fee, begin the hike between the two kiosks and climb the short section of steps. You soon come to an old roadbed that you follow to the summit. Turn left on the road and start looking out for thyme-leaved bluet and one-flowered cancer root right off the bat. After 0.1 mile the trail forks. You can take the right fork to quickly gain the summit, but it’s much easier to go left and use the gradually ascending road to climb the mountain. Plus, that’s how I outline the hike. In early May you might see a few of the Catawba rhododendron beginning to bloom, and also flame azalea, a deciduous rhododendron. Striped maple is common, but you have to look carefully to see its inconspicuous, yellow-green flowers. and, in the wet areas, mountain meadow rue and bog violet. Two more violets occur here, the more common sweet white violet and the uncommon primrose-leaf violet. At just under 0.9 mile you come to a small, flat, open area on the lower summit. The views are grand and will continue to be so as you climb along the cliff edge. Spend some time exploring the flat area. Dwarf cinquefoil and wild strawberry grow in the open ground, and below on the steep slope grow several Catesby's trillium hidden among the weedy growth. Smooth Solomon's seal is also common on the slope (not yet open in early May). The shrub with white flowers that resemble apple blossoms is black chokeberry. A special treat is the occurrence of the rare clammy locust. It’s the small tree growing in a thick tangle at the edge of the flat spot and down the slope. You'll have to come back in June to see it bloom. The wide roadbed ends at the clearing, and now a true trail continues along the southeastern edge of the mountain. A side path on the left leads a few yards to a viewing platform that is overgrown with trees. Much better views await you farther ahead. and hundreds of Catesby’s trillium. This is the best location for Catesby’s trillium that I have seen, and the petals are the most intense, deep pink I have observed for the species. Look also for Devil’s bit and smooth Solomon's seal (not yet open in early May). Squawroot is common along the trail. Several faint paths lead off the main trail for a few yards to the broad summit ridgeline. On the ridge, look for false lily-of-the valley and, with a little exploring, wild sarsaparilla. Stunted and gnarled northern red oak trees dominate the canopy, while witch-hazel and sassafras make up the understory. Continuing on the main trail, you come to the rare pinkshell azalea on the right, one of several azalea species that grow on Whiteside Mountain. Woodland bluet now start to appear and in the wet spots along the trail grow Michaux's saxifrage. At a little over 1.0 mile the trail tops out on the summit ridge and a few yards farther comes to an open view at a metal fence. On the other side of the fence grows a patch of pale corydalis. The view is wonderful, and if you look carefully you might even spot a peregrine falcon soaring or nose-diving for prey. Biologists reintroduced this federally endangered bird to Whiteside Mountain in the mid-1980s, and it has done well since. Descend to another viewpoint where the trail appears to go to the right, but it actually continues to the left along the edge of the mountain and passes a couple more viewpoints. Enter the woods at 1.4 miles and descend through dense huckleberry and several Catesby's trillium. At just under 1.6 miles, the main trail swings to the right, while an obvious side path goes left and leads to more views. Take this side path, but be careful, the rocks here are slippery. The sweeping views extend from the southeast to the northwest. Unfortunately, you can also see the second-home development that has overtaken much of the region. The last flowering shrub you are likely to see, sand myrtle, grows abundantly on the rocks at this overlook. It grows in low, dense clumps that resemble moss and has pinkish white flowers that appear in May and June. Now back on the main trail and continuing the descent, you come to a path crossing over the trail. Keep going straight ahead and climb down the steps. At 1.6 miles, the trail makes a sharp right, while a short path on the left climbs down the bank to an open view of the cliff that you were just on. This view, perhaps more than any other, displays the vertical awesomeness of Whiteside Mountain. The remaining 0.3 mile is a steep descent via switchbacks and steps to return to the old road. Once there, turn left to return to the parking area.